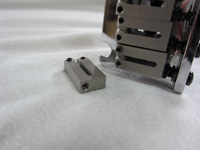 Because there are various shapes and sizes of available Strat-type bridge saddles, we frequently receive inquiries regarding whether or not our saddles can be installed with certain bridges. 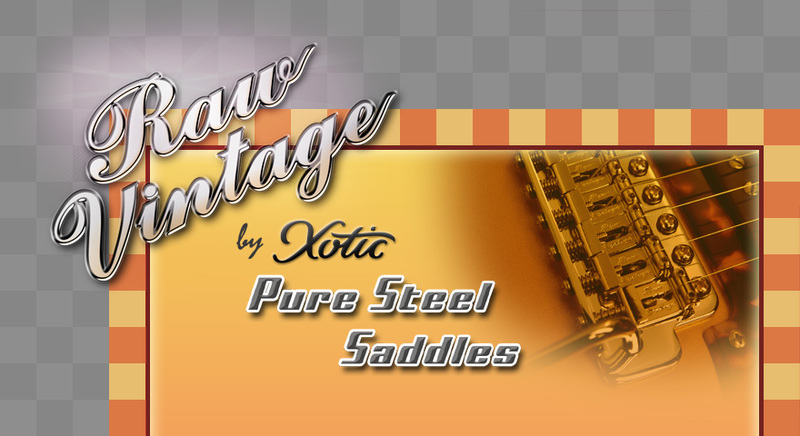 In response to the high volume of inquiries, we have done some research and put together a list of bridges that are compatible with Raw Vintage Saddles. We hope that this information will serve as a useful reference. 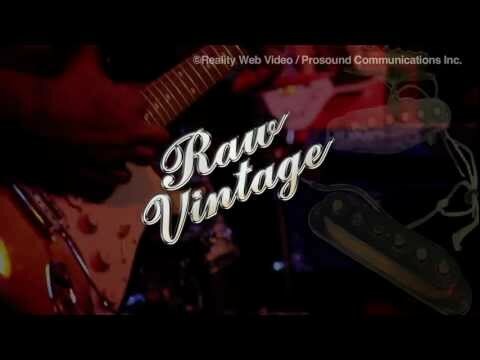 ＊We have 2 sizes corresponding to different guitars. Not compatible with Raw Vintage Saddles due to it’s size 0.413”(10.5mm). For Gotoh new product EV510 Series, you can use the 0.425” (10.8mm). How to check the size of your saddle! Measure one of your current saddles. If it’s 0.441” (11.2mm), you should choose the RVS-112. If it’s 0.425” (10.8mm), please choose the RVS-108. Also, measure the width of your current saddle from edge to edge. If it's approximately 2-11/16" (67.2mm), you should choose RVS-112. If it’s approximately 2-9/16" (64.8mm), you should choose the RVS-108. Please note that some guitars may be equipped with saddles that are not the correct size. It is important to be aware of this, especially if there are gaps between the 6 saddles. If this is the case, you should check the measurements. As shown in the accompanying photo, this can be done quite easily. Measure from the center of the 1st string’s octave adjustment screw to the center of the 6th string’s octave adjustment screw. If the measurement is approximately 2-3/16” (56mm), it’s compatible with the RVS-112. If it’s approximately 2-2/16” (54mm), it’s compatible with the RVS-108. If the measurement is approximately 2-1/16” (52.5mm), it is not compatible with Raw Vintage saddles because it is a 0.413” (10.5mm) pitch saddle. 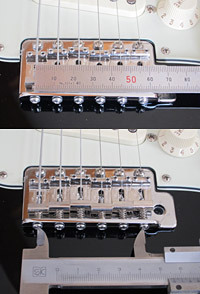 For Fender products, although you should still check the actual measurements, if the octave screw hole is not in the center as shown in this photo, it can be assumed that they are not compatible. We understand that there are many products which we have not yet been able to research, so your input is very valuable to us.